How Iridium rose from its ashes to launch the era of satellite megaprojects. Matt Desch didn’t set out to change the world, but he just might do it anyway. As the CEO of Iridium, the only company that provides satellite communications to every inch of the globe, he is at the helm of Next, a fleet of telecommunications satellites that is arguably one of the most ambitious space projects ever undertaken. By this time next year, Iridium will have sent 75 Next satellites into orbit. Each one will be replacing a first-generation Iridium satellite that has been in orbit for almost two decades. Once these new satellites are in place, they will establish radio contact with one another over thousands of miles of empty space to create the largest and most complex mesh network ever placed in orbit. 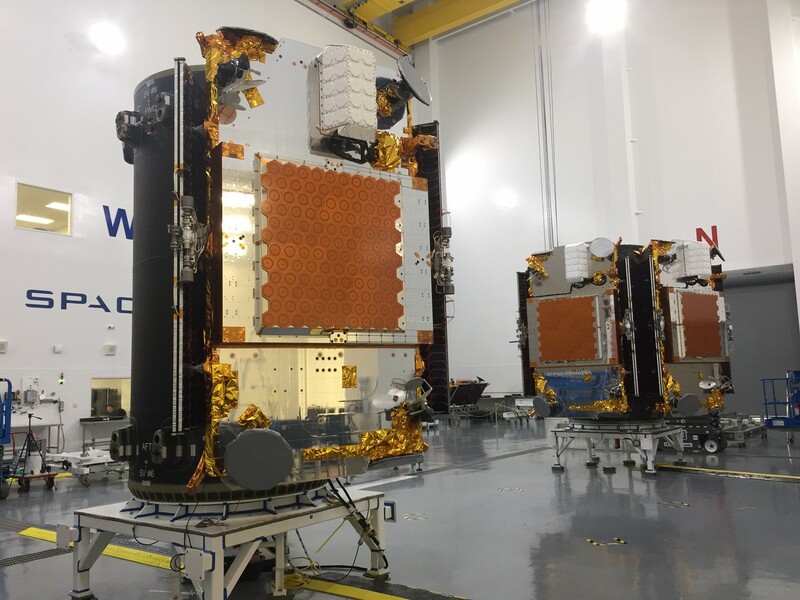 Like the first-generation network, these Iridium Next satellites will provide critical phone and data services to everyone from scientists in Antarctica and military contractors in the Middle East, to drug mules in Central America and climbers on the summit of Mount Everest. But the Next constellation also comes with a suite of new features. Not only will it provide an orbital backbone for the expanding Internet of Things, the satellite network will also be tracking planes and ships in regions they’ve never been tracked before. Almost 70 percent of the Earth isn’t covered by radar, which is why the ill-fated Malaysia Airlines flight was able to disappear into the ocean in 2014 without a trace. Iridium hopes to make these sorts of tragedies obsolete. That’s if everything goes according to plan, of course, and Iridium isn’t exactly known for its successes. A little under 20 years ago, it was the subject of one of the largest corporate bankruptcies in history. Indeed, the original fleet of satellites that Iridium is replacing with its Next constellation came within hours of a fiery demise, after the company decided to cut its losses after filing for bankruptcy and deorbit them. 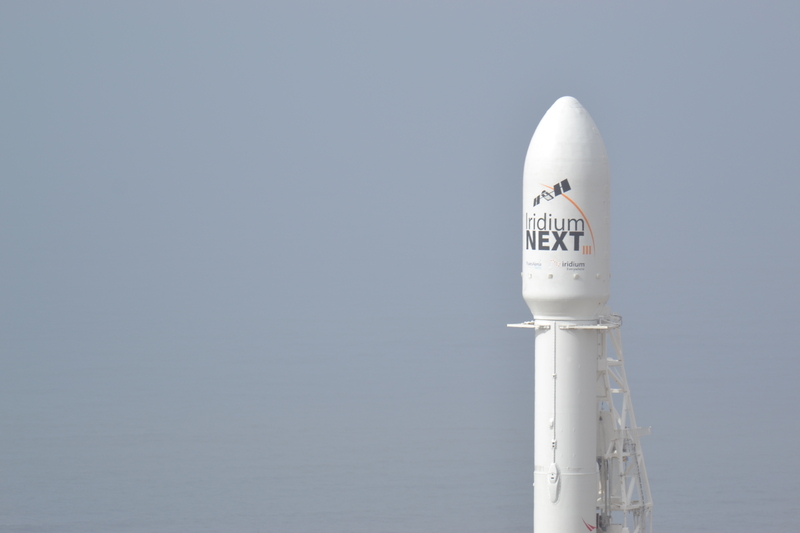 In this sense, each Iridium Next launch not only represents the culmination of several years’ worth of intensive design, research, and testing by an international team of scientists and engineers, but also the dogged pursuit of a (quite literally) lofty goal in the face of overwhelmingly bad odds. In order to get a better understanding of the stakes, I followed the next generation of Iridium satellites from their birth in a warehouse in the Arizona desert to their delivery to orbit nearly 500 miles overhead. Last October, I met Desch, who has been Iridium’s CEO for nearly 12 years, for breakfast at a restaurant in Solvang, California. We had just finished watching the third batch of ten Iridium satellites get delivered to orbit aboard a SpaceX Falcon 9 rocket that launched from nearby Vandenberg Air Force Base. It was well before noon, but both Desch and I had been awake for hours. As we devoured our avocado toast, Iridium engineers on the East Coast were busy maneuvering the satellites into their orbital planes while Desch explained why SpaceX and Iridium are ideal partners. Desch’s faith in Elon Musk’s rockets hasn’t wavered over the years, but watching the Falcon 9 rocket explode on the launch pad in September 2016 made an impression on him. The first ten Iridium satellites had been scheduled to head to orbit a few weeks later, but the explosion delayed deployment until last January. SpaceX touts its “flight proven” rockets as a cost-saving measure, but the extra risk that comes with flying on a used rocket is part of the reason why Iridium’s original contract with the private spaceflight company specified that its cargo would never be flown on a Falcon 9 booster that had previously been to space. On the other hand, the rocket that claimed a Facebook satellite that September had been brand new, a forceful reminder that when it comes to space travel there are no guarantees. Flying “used” would save Iridum some money, but it’s a gamble: Each of Iridium’s payloads is worth a quarter billion dollars and the loss of even a single one would be disastrous. 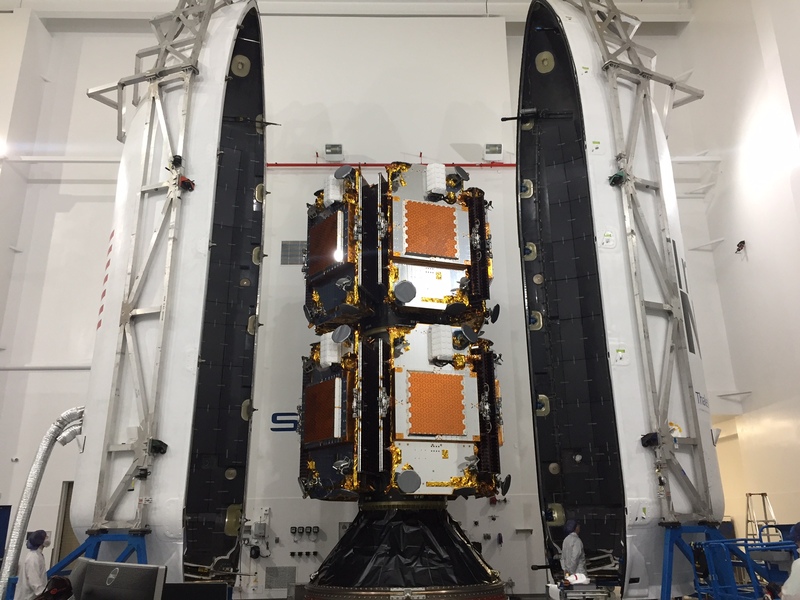 After lengthy talks with SpaceX and his insurance providers, however, Desch recently opted to send the fourth and fifth batches of Iridium satellites on flight-proven rockets. Given the high stakes of each launch, this speaks volumes about his confidence in Musk’s company. 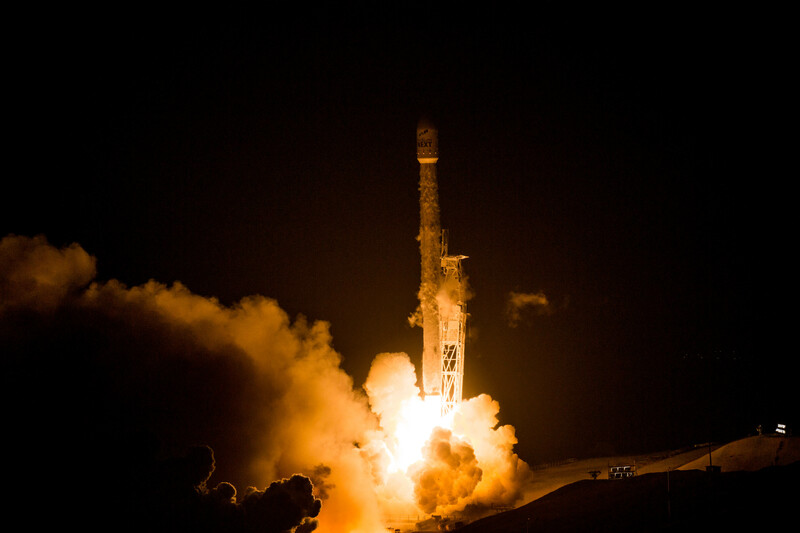 On December 22, SpaceX carried a batch of Iridium satellites to orbit on a previously flown rocket for the first time. Whatever Desch’s anxieties were about flying used, they proved to be unfounded—the launch went flawlessly. Iridium’s journey to space begins in a nondescript building in pastoral Gilbert, Arizona, a Phoenix suburb. This building is home to Orbital ATK, the aerospace company overseeing the manufacturing process of the Iridium Next constellation, and sits just across the street from a farm where a handful of cows spend their days idly chewing cud. The sterile hallways of the Orbital ATK building are cavernous and lined with doors plastered with warnings that these rooms house strictly controlled materials. Under the International Traffic in Arms Regulations (ITAR), many satellite parts are subject to the same stringent oversight as weapons like tanks and hand grenades. These technologies are usually off limits to civilian eyes and can’t be shared with foreign governments. This regulation has been a pain the side of the space industry for years, but for a visitor to Orbital ATK’s facilities like myself, it mostly meant I wouldn’t be bringing a camera inside. The facility consists of five massive clean rooms for storing and assembling satellites. Orbital ATK has registered each of these as a Foreign Trade Zone, a legal distinction that is the industrial equivalent to a duty free shop at an airport and saves the company paying steep taxes on imported parts. The largest FTZ is reserved for the manufacture of Iridium satellites, consists of 18 workstations, and has technicians in cleanroom suits working on site 24/7. Most satellites are unique and their production is a painstaking process that can last years. This wasn’t going to work for Iridium: The company needed to manufacture 81 satellites (75 to be placed in orbit with six remaining on the ground as spares) in the amount of time it usually takes to make one. In short, Iridium tasked Orbital ATK with doing for aerospace what Henry Ford had done for the automobile. This was a challenge for a relatively small company, but it had some experience in the area. In the late 90s, Orbital also oversaw the construction of the first constellation of Iridium satellites, when the idea of mass producing satellites was totally unprecedented and deemed by many to be impossible. Many of the engineers that worked on that first constellation are still at the company today, but this time the design of the Next satellites was overseen by the French aerospace company Thales. Thales had a legacy satellite design that was adapted for the Iridium payloads, but according to the Orbital ATK and Thales engineers I spoke with, the design collaboration process could still be painstakingly slow due to ITAR restrictions. Often, Thales would send its preliminary designs to Orbital ATK, only to find a number of adjustments needed to be made, even though the exact nature of these adjustments was unclear due to restrictions on the sharing of component designs. The point of these tests was to validate the design process—if the satellites still worked after this mechanical torture, it meant the other 74 satellites that would pass through the assembly line should work fine, too. After the design validation tests, Orbital ATK kicked its 18-station assembly line into high gear. Until the last one is finished, sometime in early 2018, the assembly line will see five to six satellites from start to completion each month. 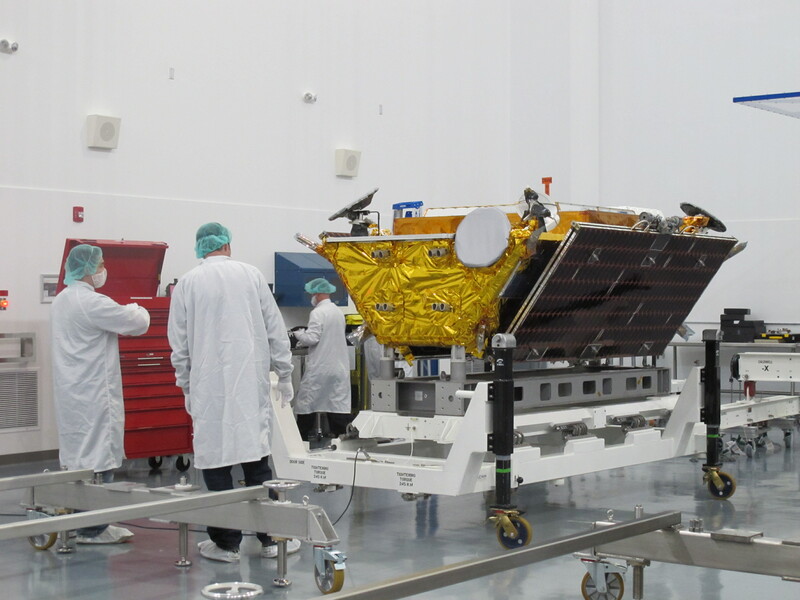 The process starts with assembling the different parts of the satellite body—called the “bus”—which is about the size of a Mini Cooper. Once the bus is completed, Orbital ATK technicians begin testing the satellite’s electronic components and communication modules, antenna alignment, and insulation. Toward the end of the assembly line, each satellite is placed in a thermal chamber for 12 days and is subjected to extremely high and low temperatures to see how it will hold up in the hostile space environment. If the satellite survives, it progresses to station 15, where the star tracker that will be used to track the satellite’s position in orbit is installed. This station also holds sentimental value for the Orbital ATK engineers—the point where a plate dedicating the craft to a specific employee or investor is installed on the craft. Next, the satellites’ fuel tanks are filled with helium and placed in an airtight tent that is pumped full of nitrogen. Due to the size difference of these molecules, the engineers are able to look for any leaks that might’ve cropped up during the assembly process. Finally, the solar panels that will serve as a power supply for the satellite are installed and the craft is basically ready for orbit. Iridium then has to decide whether or not the satellite will be one of the ten going up on the next SpaceX rocket. If not, it will join a few dozen other satellites stacked two-high and covered with black tarps inside a large storage room, until they’re ready for launch. If a finished satellite is destined to go up on the next launch, its batteries will be removed from cold storage and installed on the craft at the last station. Here, the satellite’s software is uploaded to the craft and Iridium technicians at its Satellite Network Operations Center in Virginia establish contact with the satellite to make sure they will be able to communicate with the craft while it’s in orbit. The satellite is then loaded into a custom shipping container for its journey to Vandenberg Air Force Base in California, its final stop on Earth. After liftoff, Iridium’s global network of technicians takes over to make sure the satellites are communicating with one another and the gateways on Earth as they are maneuvered into orbit—a process that can take up to a month. Once they are properly in orbit, the satellites will not only begin talking to one another and Iridium devices on the ground, but also one of the three gateways that link the satellite constellation to the telecommunications infrastructure that most of us use on a daily basis. When I visited Iridium’s main gateway in Tempe, Arizona, it was a hive of activity. (The other two gateways are exclusively for the US Department of Defense and Russia, respectively.) 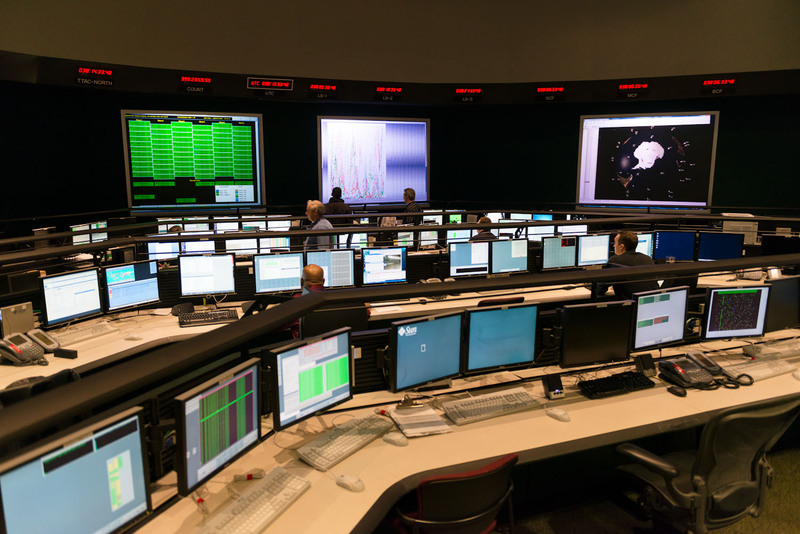 Iridium technicians sat in a darkened control room watching satellites tear across a projection of the Earth as they monitored calls being routed through the network for any signs of an error. According to Stuart Fankhauser, Iridium’s vice president of network operations, it wasn’t so long ago that the operating room was a dead zone as the company teetered on the brink of bankruptcy. Iridium was spun off as a subsidiary of Motorola in the 1990s. Its first-generation constellation was originally expected to cost around $3.5 billion, but by the time the satellites were functional, Motorola had sunk almost twice that much into the revolutionary project. To make matters worse, in the early 90s there were hardly any customers for Iridium’s satellite phone service, the constellation’s raison d’être. This was partly due to the unwieldy size of the company’s satellite phone (affectionately known as “the brick”), but mostly a consequence of its cost: thousands of dollars for the phone and then around $7/minute to make a call. Before it filed for bankruptcy, Iridium had roughly 60,000 customers, but increasing cell phone coverage in the United States and Europe meant that the very populations that could afford the device had increasingly little need for it. In August 1999, Motorola pulled the plug on its ambitious satellite project and Iridium filed for bankruptcy, just nine months after the satellite constellation went live. Unless another company bought it out—and by 1999, no investor in their right mind would touch this space-age Icarus—Iridium would be done for. Enter Dan Colussy, the former president of Pan American airlines who had been monitoring Iridium’s troubles with great interest. Just hours before Motorola was scheduled to begin the deorbiting process, Colussy was busy negotiating terms with the Department of Defense, Saudi financiers, and Motorola executives that would allow him to formally purchase the company for around $35 million, a fraction of the billions of dollars the tech giant had sunk into it. As detailed in Eccentric Orbits, journalist John Bloom’s tell-all memoir of Iridium’s unlikely rise and spectacular failure, Colussy, who didn’t respond to my requests for comment, knew the satellite constellation would be good for something, he just wasn’t sure what. Iridium was an unprecedented technological feat that simply seemed too valuable to allow it to burn up in the atmosphere. Sixteen years later, Colussy’s intuition is finally being proven correct, but Iridium’s employees told me it was an uphill battle to make it here. The gateway is one half of Iridium’s backend operations. The other half, a test facility just down the road, is constantly probing the satellite network for weaknesses or seeking ways to improve Iridium’s service. Inside the test facility are two large Faraday cages filled with every type of Iridium phone and IoT device that operates on the Iridium network. These devices are used to call two partially disassembled satellites in another room that have been programmed to “think” they’re in orbit in order to test the load-bearing capacity of the operational network and the compatibility of various devices. On the day I visited, Iridium engineers had successfully managed to place 1,700 simultaneous calls through a single satellite, a company record. 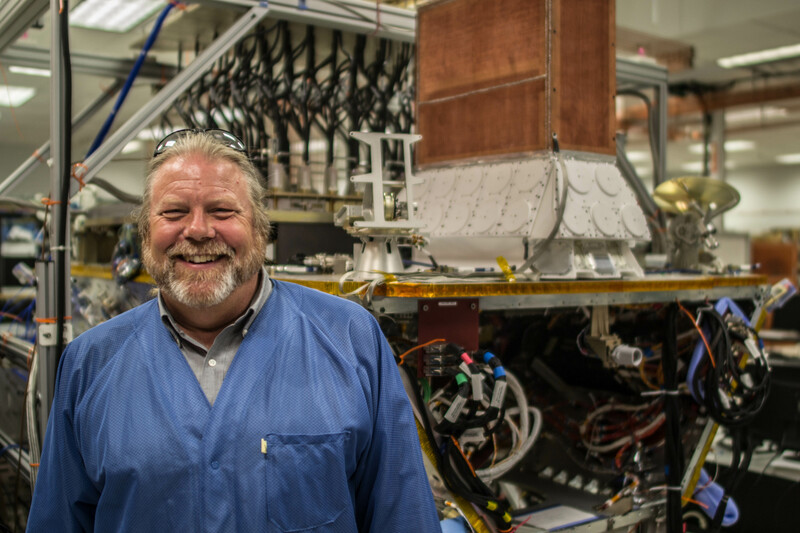 Walt Everetts is Iridium’s vice president of satellite operations and ground development and oversees the day to day activities at the test center. He showed me a large interactive map in the test center’s lobby that depicted calls on the network in real time. Small colored dots indicated different types of services: someone in Dubai calling someone in China or a sailor in the Atlantic checking their email. But the vast majority of the dots indicated machines talking to other machines. As Everetts and Desch both pointed out, the growth of the Internet of Things is a key reason why they believe Iridium will be a viable company this time around. Although facilitating calls between humans is still a core component of the company’s business, most of the network is used to route information between computers, whether these are tsunami monitoring buoys in the middle of the ocean, or chips implanted to track endangered animals. In fact, Desch said over half of Iridium’s almost 1 million subscriptions are now IoT companies looking to connect their devices. Iridium is one of the few companies in the aerospace sector, alongside SpaceX, that can claim to have anything close to a fan club. Aside from the customers actually using its products, there are a number of astroheads around the world cataloging a phenomenon known as Iridium flares. The original satellites were designed with a large reflective surface, meaning at certain angles the sunlight produces a bright flare that can be seen with the naked eye at night, even in light polluted cities. This passion was also expressed by Iridium technicians I spoke with, who had an uncanny habit of referring to the satellites in the same manner a parent might speak about their child. Indeed, each one has a name—Everetts has named two after his sons—and this adds a degree of gravitas to the deorbiting process, which can take anywhere from a few days to several months, depending on how much fuel is left in a satellite. At the time of writing, six of the original Iridium satellites launched in the late 90s have been successfully deorbited. Several others will meet their demise later this year. Yet the end of the original Iridium network is also the beginning of something new—not just for the company, but for space exploration as a whole. Today, companies like OneWeb, Boeing, and SpaceX are in a race to create massive broadband networks consisting of hundreds of satellites, but Iridium doesn’t see them as much of a threat. In the first place, most of these planned constellations are for consumer broadband, whereas Iridium provides specialized services. More importantly, however, none of these companies has even come close to getting those projects off the ground. This race to take the internet to space calls to mind other ambitious and ill-fated satellite telecommunications companies of the 90s, like Teledesic and Globalstar. Both these companies collapsed after Iridium filed for bankruptcy and demonstrated that there wasn’t a real market for satellite phones. It’s highly likely this new crop is carefully watching Iridium, just like the space industry did back in the 90s, to see whether its ambitious program will work. So far, everything has gone off without a hitch. But 35 more satellites still need to be launched. And there is plenty of opportunity for error. The gamble is a big one, and so is the reward—being the first, and only, company to provide communications coverage to every inch of the globe. Dieser Eintrag wurde veröffentlicht in Wirtschaft und getaggt mit Elon Musk, GlobalStar, IoT, Iridium, John Bloom, Matt Desch, motorola, OneWeb, satellite constellation, SpaceX, Stuart Fankhauser, Teledesic, Walt Everetts am 30. Januar 2018 von innovation.